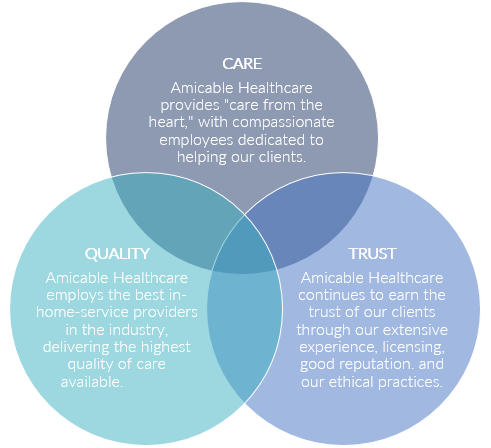 Amicable Healthcare is a reputable home care service staffing firm based in Western Washington. Founded in 1997, we have a 20-year legacy of delivering the highest quality in-home care staffing services. We are licensed by the state of Washington, and our staff undergoes a rigorous background screening process as well as training and education to ensure the integrity of our services. We focus on meeting our clients’ unique needs with creative solutions and 24/7 availability. Amicable provides care from the heart with compassionate, ethical employees that you can trust.